Give me a good cup of coffee & a book I love…And I'll be happy! Release Date: 19th February, 2015. Aimee’s wedding is supposed to turn out perfect. Her dress, her fiancé and the location—the idyllic holiday ranch in Brazil—are perfect. But all Aimee’s plans come crashing down when the private jet that’s taking her from the U.S. to the ranch—where her fiancé awaits her—defects mid-flight and the pilot is forced to perform an emergency landing in the heart of the Amazon rainforest. With no way to reach civilisation, being rescued is Aimee and Tristan’s—the pilot—only hope. A slim one that slowly withers away, desperation taking its place. Because death wanders in the jungle under many forms: starvation, diseases. Beasts. As Aimee and Tristan fight to find ways to survive, they grow closer. Together they discover that facing old, inner agonies carved by painful pasts takes just as much courage, if not even more, than facing the rainforest. Despite her devotion to her fiancé, Aimee can’t hide her feelings for Tristan—the man for whom she’s slowly becoming everything. You can hide many things in the rainforest. But not lies. Or love. 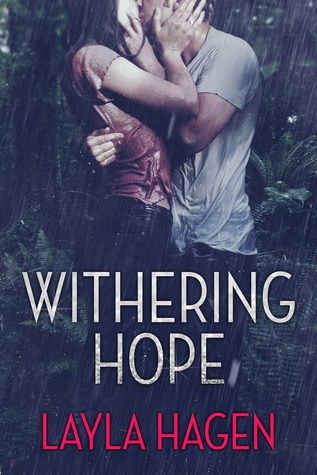 Withering Hope is the story of a man who desperately needs forgiveness and the woman who brings him hope. It is a story in which hope births wings and blooms into a love that is as beautiful and intense as it is forbidden. This is such an incredibly beautiful love story I hardly know where to begin. It is a story of despair, of love, of hope. And it is about a love story that is filled with beauty amidst a cruel setting. I cried, I laughed, and I swooned while reading “Withering Hope” by Layla Hagen, and I dare you to not do the same when you pick it up. I have only admiration for the heroine, Aimee Myller: she seems to be a strong, determined young woman, and I think that her zest for life is portrayed really well. She has a deep sense of loyalty, too, and the way she feels guilty as she begins to develop deeper feelings towards Tristan Bress feels very realistic and genuine. I would also like to add that the fact that she does everything in her power to be an asset to Tristan, instead of a liability, in the Amazonian jungle is what made me fall in love with her completely. Tristan is a very complex, mysterious, and such a closed-off character – in the beginning of the book, at least – and I admit that I was so invested in peeling away his secrets, layer by layer, that I forgot all about the time and that I simply kept reading until the clock struck two in the morning! (This does not happen often, by the way.) Once Tristan’s past and secrets were revealed, my heart broke for him, and I loved seeing how his love for Aimee changes him in many ways. This man has such a beautiful soul, and I love how the author surprised me: what you see is definitely not what you get when it concerns this man. Not in all matters, anyway. I have to say that I was a bit sceptical about the setting of this book when I first started reading it, BUT my doubts were very soon put to shame. The fact that most of this book does not involve any secondary characters at all is a bold move by Miss Hagen, but she managed to keep me enthralled throughout the entire book. The imagery in the book is very vivid and lifelike. Miss Hagen possesses a gift of transporting me into her world, and her storytelling skills are simply amazing: she truly made me believe that I was in the rainforest with Aimee and Tristan. Moreover, I have to applaud her for writing such a unique and well-researched love story. It should not come as a surprise that being the sole survivors of a plane crash makes Aimee and Tristan form such an incredibly strong bond. The fact that their connection ends up being such a profound and meaningful love – one that defies logic, perhaps – is told in a very unique way, and that is why I give the book my highest rating: 5 stars. I loved every page of this romance novel: it is different, the characters complement each other extremely well, and the environment is portrayed in a realistic way. To me, the pace of the story is perfect, and the manner in which Aimee and Tristan’s love for each other develops is remarkable, yet realistic. The ending and the epilogue made me sob – not something that happens often, I might add – but not in a sad way: no, I was a very happy bookaholic because of the beauty of it. My name is Layla Hagen and I am a New Adult Contemporary Romance author. I fell in love with books when I was nine years old, and my love affair with stories continues even now, many years later. I write romantic stories and can’t wait to share them with the world.